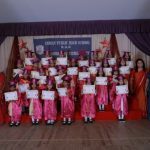 KG Graduation Day was celebrated on 16th February 2019, 3 pm onwards. Graduation for Kindergarteners is of great importance. It sets the stage and instills in the mind of young kindergartners and their parents that they have begun their 10+2 and beyond journey with a promotion from Kindergarten the staring point of their educational journey towards Primary Education. Their two years at Kindergarten was spent in laying a strong and solid foundation in partnership with all who were involved and has given them a strong footage to face the challenges of the future academically and aesthetically. Graduation Day was celebrated with great pomp and splendour. Academic year 2018-19 bid adieu to 166 Young KG Graduates and wishing them all the success in their onward educational journey at IPHS. The programme began with the g=Grand March which comprised of our School Chairman, Principal, SLT other dignitaries and our young Graduands. The students of KG1 put up a Tableau – UAE and Indian National Anthem; Welcome Dance; duties of Master of Ceremonies; Valedictorian’s address and Reply to the Valedictorians address was delivered by our KG2 student. Teachers sang a special song ‘The Leaver’s song to express their feelings at the ceremony. The Graduation Ceremony was the most auspicious part of the ceremony. The whole congregation was spell bound and with tears of joy witnessed the young Graduates receive their first Graduation Certificate. KG Annual Day was celebrated on 25th January 2019. It was a grand success. It was a day when the entire IPHS family –Management, Students, Parents, Senior Leadership Team, Teaching and Non-teaching staff came together. It was an important milestone in the life of our young kindergartners to showcase their innate talents and develop public speaking skills. To imbibe cultural and moral values through their dance and song performances. They were Prima Donnas on that day decked up in all their finery – specially designed costumes and accessories. The Theme for KG Annual Day 2018-19 was ‘Sharing, Caring and Tolerance’. Each of the 12 programmes conveyed the theme through song and dance performances. The skit ‘Rainbow Fish by Marcus Pfister was enacted by the students of KG1 to integrate literature with the theme. KG2 students compeered the whole show which was indeed heart rendering and a proud moment to witness Kindergartners aged 5 -6 confident at public speaking. To celebrate the Christmas season and forth coming New Year a special assembly was conducted. A skit titled- Reason for the Season, Theme: Love, Hope, Faith and Charity. Finale dance to the beats of, Wish you a swinging holiday. The programme showcased the innate talents of our students and was a perfect platform to create a link to PS 1, 2, 3 & UAE National Agenda Parameters. Fun with Mom Evening was conducted on 9th December 2018 for KG1 and 10th December 2018 for KG2 from 5.30 pm to 7.30 pm at IPHS School Quadrangle with an objective to develop social, emotional, aesthetic and cognitive skills. It was an endeavour to create special memorable moments for our children and their moms. Fun with Mom is a very sacred auspicious traditional ritual followed by the IPHS family to celebrate both motherhood and childhood. To make the evening enjoyable Kindergarten teachers organised exciting activities such as: Nail Art; Face painting; Henna Art; Floral Art; Rangoli Art; Sandwich Making; Vegetable Art; Napkin Folding; Tissue Box Designing; Dancing; Games – team building, bowling, Ring the object; Puppet Show and Singing. Parents participated enthusiastically and enjoyed the evening with their children. Their positive feedback was so expressive in written and verbal mode, the happy look on their faces filled the environment with love and cheer. The 47th UAE National Day was celebrated with great enthusiasm and patriotic fervour on 27th November 2018 at the IPHS campus to extend solidarity in the celebration of UAE culture, rich heritage and commendable achievements. A tableau- UAE National Anthem, KG 1 students were dressed in traditional Emirati clothes; some dressed as UAE soldier, policemen etc. A dance performance by KG 2 to the beats of Aibk Al Emarat. A Skit –Titled- From a dessert land to a green paradise, a vision actualised by the founding father of UAE – HH. Sheikh Zayed Bin Al Nahayan. The theme: If we try we will succeed; nothing is impossible. The programmed showcased the innate talents of our students and was a perfect platform to create a link to PS 1, 2, 3 & UAE National Agenda Parameters. The three prime areas -Personal, Social and Emotional Development (PSED); Physical Development (PD) and Communicative Language (CL). The four specific areas are Literacy (L), Mathematics (M), Understanding the World (UW) and Expressive Arts and Design (EAD). The competition was an IPHS endeavour to develop the above mentioned areas of learning in our young Kindergartners as they explore a variety of materials, experimenting with colour, design, texture, shape, and form. KG1 – Colouring Competition, KG2- Free Hand Drawing (Theme- Scenery depicting ‘Weather & Seasons’). The Competition was conducted on Monday, 26th November 2018 for KG1 it was Scenery Colouring Competition and for KG2 – Free Hand Drawing (Theme- Scenery depicting ‘Weather & Seasons’). The winners of the competition were felicitated with certificates during the Assembly. Literacy week was celebrated from 18th November 2018 to 21st November 2018 to expose students to the world of literature and reading. Different activities were scheduled during the week like DEAR (Drop Everything And Read) – students swapped their story book with a classmate and the whole class read and browsed through the pages, they shared their own story elements with the class for example characters, where the story takes place what happens in the story, the character they like etc. In addition they drew a scene from their story. On day two they designed beautiful- Book Marks and day 3 ‘The Finale Day’ students came dressed up in Story Book Characters and introduced the characters they were dressed up as. Fruit Salad day was celebrated on the 19th November 2018. Keep in mind the change in the weather conditions and health related maladies students were advised to bring cut fruits or a fruit salad from home. Students wore their chef caps and fruit bands and explained to their classmates the fruits that were used in their salad and how they made it. It was a delight to witness our young kindergartners as Chefs. Some of them proudly advised each other on the benefits of eating fruits and a fruit salad was a recipe using fruits. Their slogan for the day Fruits! Fruits! Every Day keeps you fit and gay! The KG Annual Sports Meet was an arena to develop sportsmanship skills; build stamina and fitness through athletics; enhance personal, social and emotional skills of collaboration, confidence, team spirit; communication and fair play; innovation and entrepreneurship. In addition, to creating links to the taught curriculum (PE), cross curricula , UAE and real life application and development of fine and gross motor skills. The Annual Sports Meet began with a universal fact that ‘Practice makes a man perfect’ and this was exhibited through the practice sessions and the sports heats which witnessed young sports personalities being born, who had carved a niche as budding semi-finalist ready to compete at the finals which was scheduled for 2days 13th & 15th November 2018. The Finale Day of KG Annual Sports Meet was a spectacular event. It began with the ignition of the Olympic Torch by our Principal, Mrs. Anubha Nijhawan and Kindergarten Sports Captain. Mast. Nabhan Mofleh which was followed by the March Past Parade which comprised of five squads – the four houses Pawan, Agni, Prithvi and Varun and leaders squad and were led by their respective House Mistresses, House Captains and Leaders squad. KG1 students energetically performed their display performance to the beats and lyrics of A. R Rehman’s -Zinga. The Athletics Events for KG1 were Relay Race; Moon Walk; Tunnel Race and for KG2 Sprint 50mts; Relay 50mts ; Task Race – Shoe & socks, Book Balancing. The KG Annual Sports Meet was a very successful and innovative event. Children’s Day was celebrated on 13th & 14th November 2018. On 13th November 2018 a special assembly was conducted to convey the love and deep affection the IPHS family has for their children. Teachers are the extended parents in a student’s life. KG teachers were so excited to let their bundles of joy know, that each one of them was precious. They conducted the assembly by putting up a special programme in their honour, a group song by KG 1 & KG 2 teachers. A special dance was performed by Mrs. Jitha Ajith and Mrs. Kunthal DeepakRaj dressed up as clowns, swaying and tapping energetically to the beats of the song selected, without any inhibitions, they were later joined by Mrs. Sherin Lawrence, Mrs, Anila Rajeesh, Mrs Nithya Prasanth, Mrs. Jeba Sanderson, Mrs. Neetha Madhavan, Mrs. Jitha Ajith and Mrs. Vinitha Babu. The dance went on to another spectacular dimension with all the teachers on stage! 14th November 2018 is also significant as it marks the birth anniversary of our late Prime Minister Pandit Jawaharlal Nehru, Mrs. Roshini Jis dressed up as Pandit Nehru which added flavour to the assembly. On the same day children came dressed up in party wear, the school distributed goodies. The children were happy and excited with their chocolates, juice, muffins and biscuits. Teachers created a memory niche in the hearts of our young kindergarteners, they presented them with special handmade cards, designed and crafted with all their love and passion. These cards will surely be preserved by parents for their children, a memory of their Kindergarten teachers. The Action Song Competition was a perfect platform to offer rich learning experiences that have children memorizing information in a variety of ways. The competition enhanced children’s learning musically, verbally, visually, and physically – all at the same time. The combination of all of these learning styles, are found in children’s action songs. These strengthens memorization of information and the ability to recall what has been learned. In addition it helps to develop fine and gross motor skills. On 7th & 8th November 2018 students of KG1 competed in English Action Songs whereas, students of KG2 competed in three different languages –English, Hindi and Malayalam on 14th October 2018. Both the winners and participants very confidently participated in the event overcoming stage fright and developed public speaking skills. The Flag Day marks the anniversary of Sheikh Khalifa Bin Zayed Al Nahyan becoming the President in 2004. Every year on November 3 people in the Emirates celebrate this national occasion, in which they reaffirm their allegiance to the UAE flag, which is a symbol of the country’s unity and greatness and represents their aspirations for a better future. The Kindergarten students of IPHS came dressed in the colours of the UAE Flag on November 1 2018. Master. Joshua of KG 2B addressed his fellow classmates, informing them about the historical background of UAE flag Day. On completion of the speech students swayed the UAE Flag high to the beats and lyrics of the song ‘This is My My My ! Beautiful Country! This Is My My My UAE! Kerala Piravi marks the birth of the state of Kerala in India. The Kerala state was created on November 1, 1956. Students of KG celebrated it with great enthusiasm. Mast Joshua-KG 2B spoke a few words on the importance of Kerala Piravi Day. Thereafter students swayed to the beats of music in Malayalam which had a message informing the gathering as to what Kerala Piravi is. Folk Dance Competition was celebrated on 27th October 2018. Students of classes KG 1 & KG 2 participated in the competition. It is a perfect platform to showcase their innate talent in Performing Arts. The competition was a testimony to great parental support effort and enthusiasm. They were the driving force behind the success of this event. Folk Dance Competition at IPHS was an endeavour to keep alive the varied rich culture, tradition and heritage of a nation. 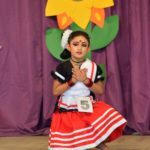 Folk dancing is a wonderful way to introduce young children to the world’s rich diversity, to teach the enjoyment of dance, music, and rhythm, and to begin a live long habit of the social enjoyment and physical activity of dancing. Folk dance is also an excellent way to provide a legitimate outlet for kinesthetic learners, and an avenue to challenge the active children. IPHS believes in the overall development of each and every child socially, emotionally, aesthetically and intellectually. KG Costume Day was conducted from 21st October to 24th October 2018. It was a platform to enable students to perform on stage. For our KG1 students it was their debut performance on stage. Costume Day paved the way to overcome stage fear and inculcate developmental skills such as cognitive, emotional imaginative, public speaking, empathy, imagination and creativity; socialization; career choice etc. Our Kindergarteners were dressed up as doctors, air hostess, scientist, soldiers, policemen etc. exploring future career goals and their present surrounding a part of real life applications- their world around them. Some were dressed up as super heroes from their media world and imagination. Almost all the students were able to speak and introduce themselves and the character their costume represented. Parents were filled with excitement and nostalgia to see their bundles of joy, who just yesterday were toddlers; now standing before them on stage. The moment was so precious and auspicious. Numeracy Week was celebrated from 7th -11th October 2018. Different activities to develop and enhance mathematical skills still further in the young kindergarteners. The activities included Designing and crafting clocks; sorting shapes and designing objects using shapes; collage of currency from different countries Designing a weighing scale using coconut shells, themocol cups / bowls or any other best out of waste material; Real life application activities to reinforce concept of measurement using objects. A Special Assembly was conducted during Numeracy Week. Numeracy Week was a roaring success. KG1 students visited ‘Arab Co for Animal Farm, RAK’ on 4th October 2018 as part of their ‘Educational Field Trip’. The success criteria of the trip was that students could link their experience to the taught curriculum basically EVS (domestic Animals), Numeracy (they counted the cows) etc. The trip began at 9.30a.m with their journey to the farm all excited and chirping, happy faces. At the farm children were conversing about how and where their milk came from. KG 1 students also could identify the Ghaf tree in the surrounding and the farm vehicle – a tractor. All of them were delighted to receive a bottle of date milk from the ‘Arab Co for Animal Production’. KG1 students returned to school happy at 10.30 am with firsthand knowledge and material to compile a non-fiction story of their own ‘On the Farm’. A special assembly was conducted on 2nd October 2018 during school hours to commemorate the birth anniversary of Mahatma Gandhi – Father of India. This assembly had a special theme and message for the young kindergartners on the values and principles propounded by Mahatma Gandhi- ‘We should not see , hear , speak or see anything evil; all are one in religion, race, caste or creed. Song – Raghupathi Raghu Raja Ram- All religions are one. 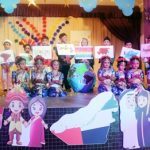 The students of the kindergarten section participated in the Saudi Arabian National Day Celebrations an initiative by UAE to extend their solidarity with the people of Saudi Arabia. Kindergarten students paid due respect when the Saudi National Anthem was played. Teachers projected the Saudi National Flag on the board on the SMART Board while KG2 students coloured the flag as part of their classroom activity. A collaborative fact file competition on Kingdom of Saudi Arabia was declared for the class teachers, parents and students. A demo on the importance and the correct method of brushing was conducted for the students of KG1 & KG2 students on 11th September 2018 and 13th September 2018 respectively .The aim was to create awareness on dental hygiene and encouraging the toddlers to follow routine dental regime. The workshop was a great success. Teacher’s Day Celebration at IPHS was a most auspicious and cherished moment for the teaching fraternity. A special day to celebrate and honour members of the noble profession. This day was selected to commemorate the birthday of a noted teacher and former President of India Dr S. S. Radhakrishnan. A speech on the role of teacher’s in a student’s life. An action song titled ‘We love you teachers………Aap ko karte hain naman’. Students exhibited their love for their teacher by presenting a memento ‘A Bag of Responsibility’ and a beautifully handcrafted card. To embed UAE culture in the IPHS community the date festival was celebrated on the 7th June 2018. It was a whole school programme students brought different varieties of dates neatly labelled with the name of the variety and relevant information. Kindergarten students showcased their date display in the corridor of A Block. It was a mini Liwa Date festival right here on IPHS Campus. KG students visited the display put up by their peers from the Primary Section and were congratulated for their exquisite and beautifully displayed dates. To commemorate ‘World Environment Day – 5th June 2018’, a week long programme was conducted from the 3rd June – 7th June. The highlights of the programme were the ‘Environmental March’ with slogans such as –Plant a Tree, Reduce, Recycle and Refuse’, Reduce your Carbon foot prints’ embossed on T-shirts. KG2 students visited the Ministry of Education and Waste Management Authority Office. Our future world environmentalist carried forth a special message too – an appeal to their peers and elders to safeguard ‘Mother Earth’ for them and future generations. They distributed handmade brown paper, & newspaper bags ; decorative articles made out of waste and plants. Other activities were designing articles made out of waste – savings box, newspaper bags, flower pots etc. There was a special competition to enhance parental involvement – ‘Best out of Waste Competition’ between parents and teachers. Objective: To develop students’ personal and social development; and their Innovation skills- PS2, 2.3 Social responsibility and innovation skills. Element: 2.3.2 Work Ethic, innovation, enterprise and entrepreneurship. Students of KG 2 celebrated ‘Art Week’ 13th May – 17th May 2018, with great enthusiasm and self- satisfaction. To inculcate the love for art and design which is their favourite subject as they are active 21st century learners who enjoy the idea of hands on activity. These young budding entrepreneurs were busy with their enterprise of creating and designing artefacts –magazine pages paper bags (best out of waste) plastic glass flower vase, paper plate mother’s day greeting card, paper plate fish wall hanging etc. The ‘Art Week’ was a perfect platform for our children to express their creative skills, enjoy and take pride in their own achievement. To inculcate values and social responsibility like universal brotherhood, global citizenship, religious tolerance and enterprise Kindergarten students at IPHS were oriented on information pertaining to Ramadan through a youtube video clip that it is a holy and auspicious month observed in Islam. It is a month of fasting and prayers. Kindergarten students designed and presented a Ramadan greeting which was beautifully designed and coloured projecting love and affection towards their classmates and family. Hallways were decorated with artefacts symbolising and heralding the beginning of the holy month of Ramadan. The entire IPHS family joined hand in solidarity to respect and partake in the culture and religious sentiments of their Muslim brethren. ‘A mother is she who can take the place of others, but whose place no one else can take’. Students at IPHS celebrated ‘Mother’s Day’ with great enthusiasm and excitement. The young kindergartners were all full of happiness, emoting great love and affection for their mother. Students exchanged information about their mother in the group discussion and talk to inform session ‘My Mother’. Sharing the personal bond they shared with their mother. Each one excited to say that their mother was the best mother in this whole universe. Their talk was based on the qualities and skills their mother possessed. Some examples: ‘My mother is a queen’, She is the best Chef in the world, My mother is very clever. She is good and kind etc. To express their love students made hand designed cards and jewellery using macaroni a very heart warming and innocent gesture to convey their abundant love. What a tribute to mother’s! It is true –‘A hand that rocks the cradle rules the world’. Objective: To inculcate the values of leadership and meet with P6 as per UAE National Agenda Performance indicators. Kindergarten Investiture Ceremony was held on 8th of May 2018.The Chief Guest at the occasion was Mrs. Helen Skaria – MD of Kinderwood Nursery, other distinguished dignitaries – Vice Principal Dr. Annamma Mathew, School Coordinator Mrs. Ligy Ajith Abraham, Middle Section Supervisor Mrs. Soumya Shree, Primary Section Supervisor Mrs. Shammy Santosh, elected Kindergarten Student Council Leaders, Staff and Students. The programme was conducted in three phases. Assembly – Quran Recitation, UAE National Anthem and Saluting the flag, School Prayer, Vision, Mission, Motto and welcome Speech by the Vice Principal, Dr. Annamma Mathew. ‘Student Leaders March’ with the message based on their respective portfolios. Oath taking Ceremony – Pinning of badges and conferring of flags by our – Honourable Chief Guest, Mrs Helen Skaria along with distinguished dignitaries -Vice Principal, School Coordinator, Supervisors and School Counsellor. Kindergarten students were addressed and Mrs. Helen Skaria shared the importance of following the ‘Play and Learn theme’ while delivering the Kindergarten curriculum. Kindergarten Student Council Portfolios: Head Boy, Head Girl, Sports Captain, 8 House Captains (Boys and Girls -Agni, Prithvi, Pawan and Varun), School Leaders (Environment, Innovation, Health & Safety, Activities, Happiness and Discipline). The KG 1- ‘Colour Carnival’ conducted at IPHS Kindergarten Section from 29th April to 24th May 2018, was a roaring success .Four weeks of an array of activities ,each week had a special colour theme representing the four house colours followed by the school house system, Agni(Red) , Prithvi (Green), Pawan(Yellow ) and Varun (Blue). ‘Colour Carnival’ was flagged off by students coming dressed in the themed colour of that particular week- on the first day , followed by activities like colour song , designing and making articles symbolising the themed colour of the week .Photographs and artefacts are testimonies to positive work ethics, innovative and creative skills. During the activity students took initiative and made decisions to carry out their creative idea. The artefacts like hand printing design, necklace making, mother’s day greeting card, paper plate butterfly wall hanging speak volumes about our children’s first steps towards entrepreneurship and enterprise. The 11th of April marked the beginning for the young kindergartners (KG 1) at IPHS. The kindergarten campus was brightly decorated and the theme was ‘Play , Learn and Grow’. It was a moment of sealing a parent , school student , teacher partnership ,to lay a strong foundation for a bright tomorrow. The entire Senior Leadership team and school fraternity was out to see the children were safe , happy and secure. The young kindergartners enjoyed the goodies distributed by the school. Classroom activities were all play and learn themed. Students were given a memento which said IPHS’ Loves you’ on a small silver heart. In addition, a booklet ‘ All About Me’ was distributed fostering a strong parental engagement- the best 3 decorated booklets would be awarded prizes , along with a special welcome note from the class teacher. The first day began well to carry forward the school vision , the vision of the UAE National Agenda and above all the vision of the founding father of UAE His Highness Sheikh Zayed Al Nahyan. Orientation Day for the Kindergartners was held on two different days. For KG1 it was organised on the 31st of March and KG2 on the 7th of March. The agenda for both the days were the same. The Orientation Day began with registration and dissemination of information through the welcome address by –Mrs. Anubha Nijhawan, Mrs. Bitty Devasia –Counselor, Mrs. Sandra Edward Fernandes – KG Supervisor with regards to school expectations, rules and regulations, important school policies and routines and procedures. A special hand out was distributed which contained additional information on school bus travel, own transport, ID Cards, first week tentative class schedule and other important things. Parents were taken on a walkthrough –KG environment. The Orientation Day ended on a note of happiness assurance and trust in the IPHS brand name.